I have been watching with great interest as the lava flow on the Big Island of Hawaii inches closer and closer to the town of Pahoa. The Big Island is one of our favorite vacation destinations, and I feel terrible for the residents of this small town who are waiting day by day, wondering if their houses will be destroyed. 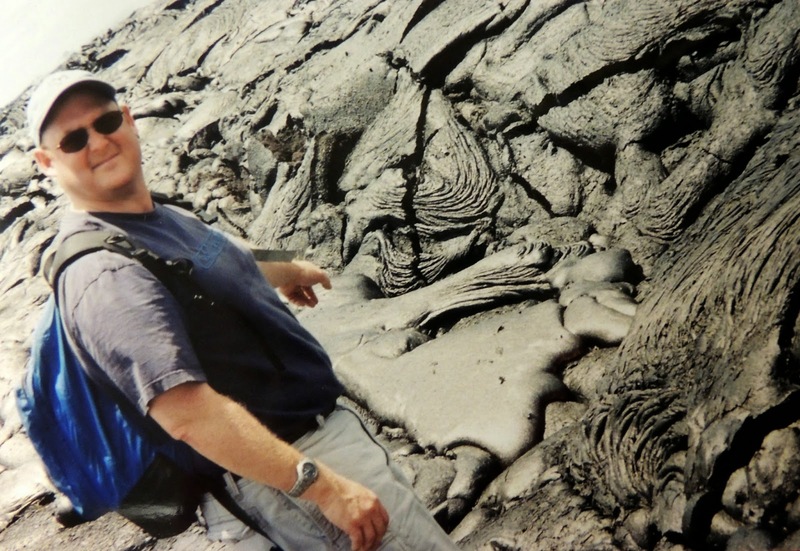 On a visit in 2005 we took a hike through the Kilauea lava flow in Hawaii Volcanoes National Park. 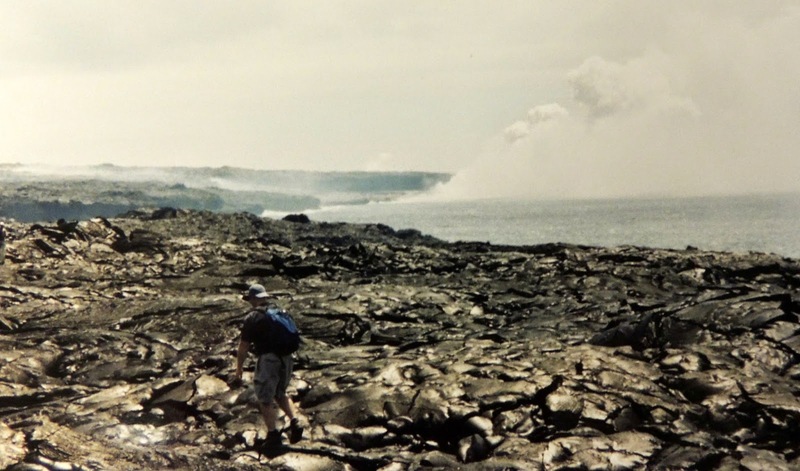 I'm not sure if hiking is still allowed, but at that time, Park Rangers marked established trails and it was possible to walk several miles and see the lava flowing into the Pacific Ocean. This was one of the most difficult hikes we have ever taken, but by far the most fascinating. In the 1990's the lava crossed the main road, and as we parked our car and headed to the trail head it was eerie to see where the road had just ended. Even though there was a crudely marked trail, the terrain was very rough and uneven. At times you would turn a corner and see pahoehoe lava a short distance away. It was amazing to see new parts of the island being formed. 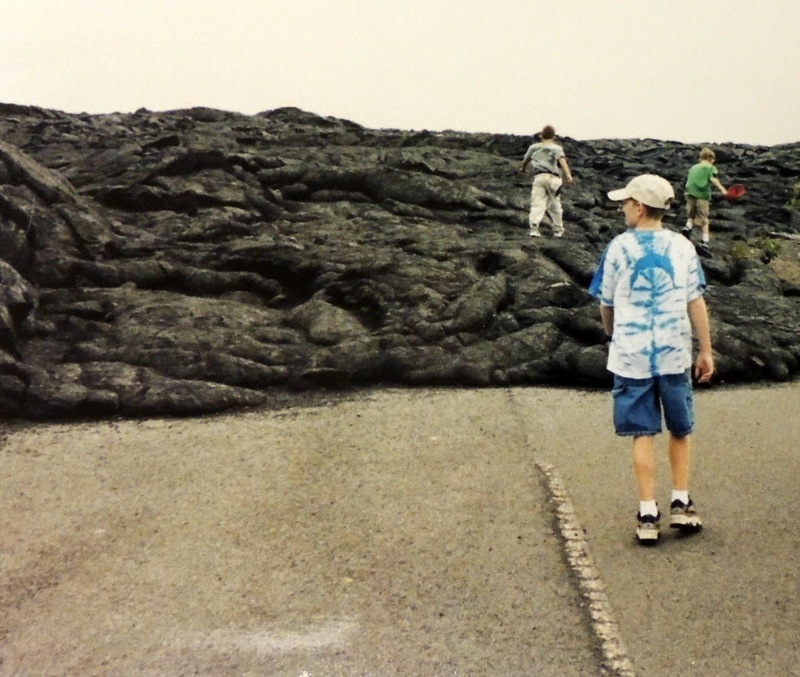 G and I posed for pictures near the lava, but the boys wouldn't get anywhere near it. Obviously they are smarter than their parents. It was so hot that we ran in for a quick photo and ran back out again. 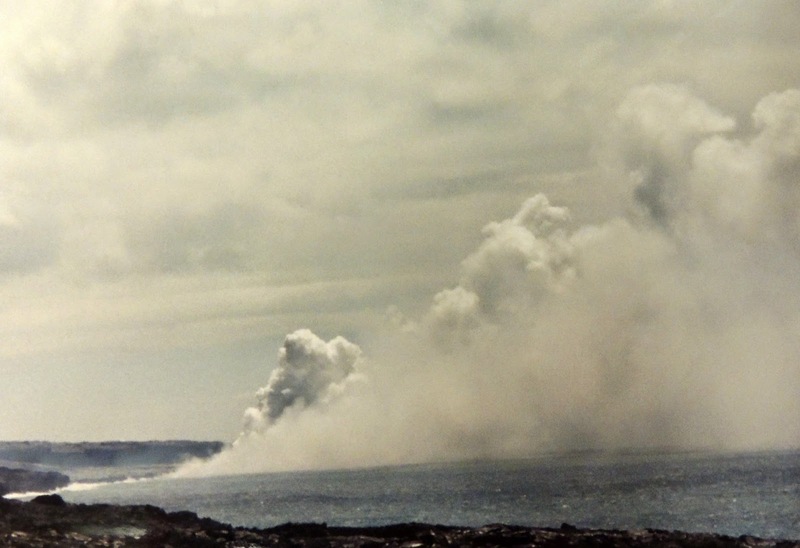 After many miles we reached our destination - a view of the lava flowing into the Pacific Ocean. We could hear it sizzling as it hit the water and cooled. Of course, we then had to hike back out. 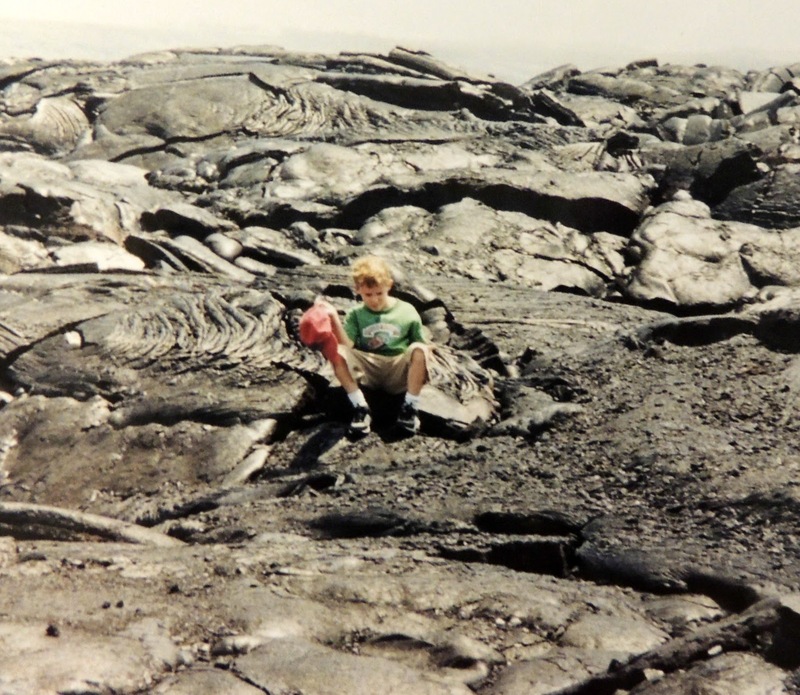 T wasn't very happy with this turn of events and just sat right down in the old `a`a lava. I read an article recently about the possibility of diverting the lava flow away from the town of Pahoa. In 1983 this was successfully done at Mount Etna on the east coast of Sicily using explosives and bulldozers. Although the cost was approximately two million dollars, 100 million in property was saved. Most Pahoa residents, even those whose homes are in danger, don't want to divert the lava. The volcano has deeply held religious significance to many Hawaiian people, and they feel that she deserves their respect. In recent days the lava flow has slowed even further. We will have to wait and see what Mother Nature has in store for Pahoa and the Island of Hawaii. This doesn't look like a fearful person! Fanny packs are useful aren't they! How awesome it would be to visit there now and maybe even see a fountain! Thank you for sharing your thoughts. I've given up my fanny pack in favor of a backpack these days - but they are nice to carry essentials! I've been following the amazing event of the lava flow too. 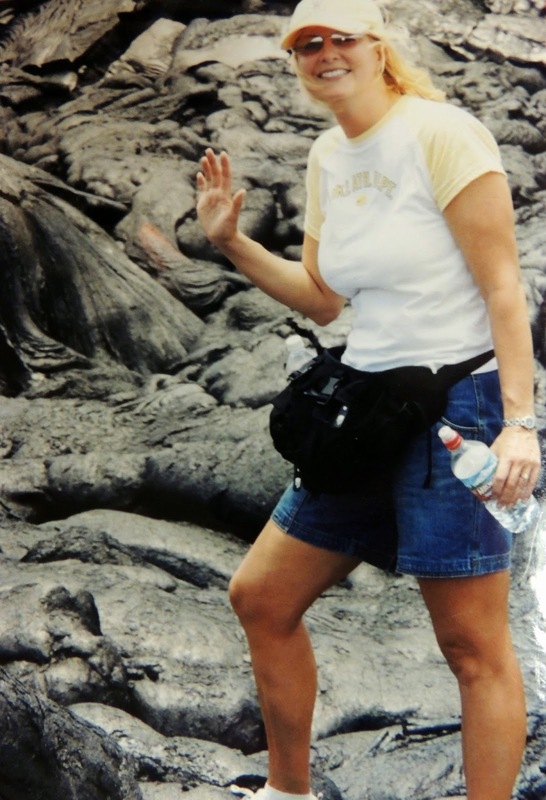 I've been to different Hawaiian Isalnds but never to the lava flow. Fun! If they still allow hiking there, I would recommend it to anyone. Really fascinating. Incredible forces of nature that is not real common! Only the Hawaiian people would have that kind of respect and attitude toward the lava flow. They definitely respect the volcano! Fun hike! But I probably would have waited in the parking lot. :) I saw a movie years ago, when I was little, that stayed with me FOREVER. Devil at 4 O'clock. 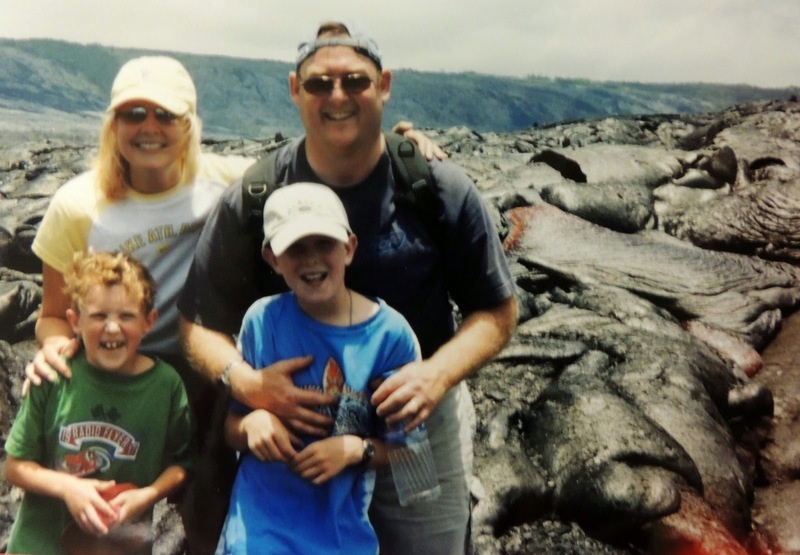 For months, I had nightmares about slowly-moving lava flows and having nowhere to run. Yikes! Whenever I hear of an eruption anywhere, I'm immediately awash in memories. So to speak . . . I'm so glad I haven't seen that movie! Our worst injury that day was a scraped knee from the old lava! Fabulous photos. This world just seems so foreign to me. I'd love to visit. I have a wonderful friend of Hawaiian descent, who grew up there. All of it just fascinates me. Thank you for sharing a smidgen of lava. It was so interesting, and I would recommend it to everyone! Good for you on making that difficult hike. It does sound like a fascinating thing to do. Wow, how cool is your trip. And the pictures are great too! I love looking at old vacation pictures. It was fun to look at these and see how much the boys have grown! 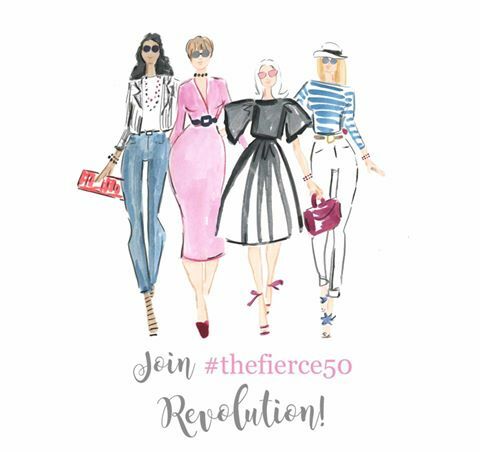 That is fabulous! I have always wanted to visit Hawaii and walk on lava. Did it smell bad? Sulphur? Great pictures!! I don't remember the sulphur being too strong on this hike - it's actually stronger up near the crater. It was so fun! Thanks for visiting. Wow.. a high cost to protect, but to save 100 million?? That's big. It was kind of scary, but so worth it. 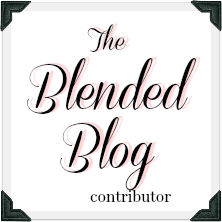 I've traveled a lot, but never (sadly!) to Hawaii! What an amazing hike and experience for your boys. Thanks for sharing these cool photos, Lana. Lava flow is quite different than I pictured it to be. I can't believe you haven't been to Hawaii! It was definitely different than what I expected. That must have been very cool to see. I didn't know they thought of the volcano as a sacred thing. So interesting. Thanks Lori. It was really interesting. With all the places you've traveled, you need to get to Hawaii. You would love it!